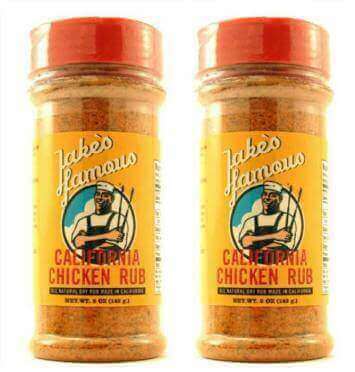 IN STOCK: Jake's Santa Barbara Maple Smoked Seafood Dry rub for sale 2 pack is excellent for fish, steaks, Chicken, pork, Tri Tip and more. This is the perfect dry rub to delivering amazing smoky maple flavor combined with hints of cayenne, chili powder and rich brown sugar that enhances the taste of your fish, chicken, ribs, shellfish, steaks and more. The rub contains a wonderful blend of New Mexico Chili Powder, Brown Sugar, Black Pepper, Garlic, and Cumin with hints of smoky Maple Sugar and the faintest bits of Cayenne peppers. It's the perfect combination of wonderful spices and a fantastic maple sugar aroma blended with perfect bits of cayenne. With these perfect seasonings make golden mouthwatering red snapper, Talapia, Chilean sea bass, salmon, chicken legs, thighs and wings that are juicier, tastier and more full of flavor than you've ever had before. Perfect for roasting, and even better on the grill. Extremely versatile seasonings that can be mixed into chili or direct sprinkled to make seasoned French fries. Mix with mustard and prepare ribs for the grill. Uses: Salmon, Sea Bass, Snapper, Pork ribs, chicken, steaks, dry rub bbq ribs, beef ribs, and Tri Tip. Easy to use: Just shake on the Santa Barbara Smoked Seafood Dry Rub for sale Seasoning wrap and rest for 45 minutes or more. This dry rub because of its all natural ingredients does not require rubbing. Our Santa Barbara Dry Rub is full bright flavors of spicy and inviting dry rub. 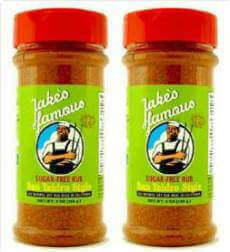 Richness and awesome taste combined in an exceptional shake on Rib Rub. Step up to this fantastic Rib Rib and BBQ Rub combination.